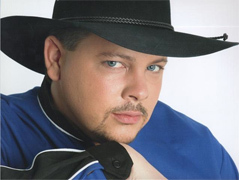 Dean Simmons began his career as a Garth Brooks tribute in 1994 and has since become one of the most sought-after acts in the industry. In 1996, after appearing in various other tribute shows, he was hired to perform in the world famous "Legends in Concert" in Las Vegas, Myrtle Beach and countless short tours and one-night performances across the country. In 1998, while looking to expand his act, Dean produced and directed his own 90-minute "Tribute to Garth Brooks" concert based on Garth's live show. The reception was overwhelming and he has since performed for hundreds of very satisfied clients including corporate event sponsors, fairs, festivals, casinos, and universities from coast to coast as well as overseas.